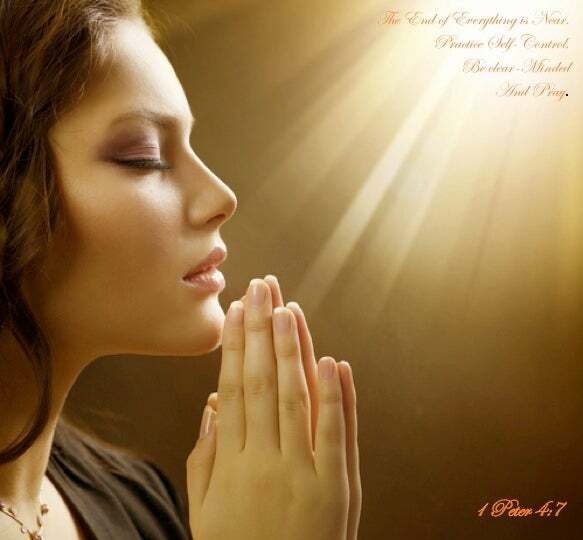 ﻿ 1 Peter 4:7 But the end of all things is at hand: be ye therefore sober, and watch unto prayer. But the end of all things has approached. Therefore be serious, and be sober for the prayers. But the end of everything [as far as your lives are concerned] is near, so be sensible, and sober [so as to be] prayerful. But the end of all things is at hand; be sober-minded, therefore, and watchful, that you may pray. 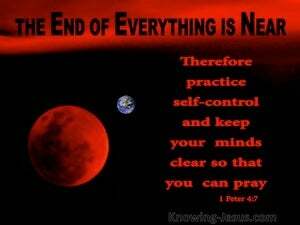 The end of all things is near; therefore be clear minded and sober for your prayers. The consummation of all things draws nigh. be temperate, be vigilant in prayer. Now the end of all things has approached; be, therefore, sober, and watch to prayer. But the end of all things is near. Be serious and collected, therefore, and pray. But the end of all things is at hand; be ye therefore sober, and watch unto prayer. And the end of all has drawn near: be ye therefore of sound mind, and live abstemiously in prayers. Now the end of all [things] draws near. Therefore be self-controlled and sober-minded for [your] prayers. But the end of all things has drawn near. Therefore be of sound mind, and be sensible to prayers. The end of all things is at hand. Be ye therefore discreet, and sober, that ye may be apt to prayers. Now the end of all is near. Steady then, keep cool and pray! 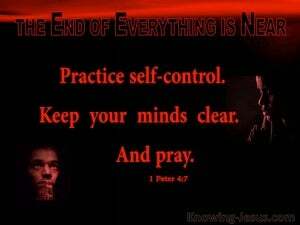 But the end of all things is close at hand; so be sober, watch and pray. But the end of all things is near: be ye therefore sober-minded, and vigilant in prayers. But the end of all things is near. Therefore exercise self-restraint and be calm, that you may be able to pray. But the end of everything on earth is near. So be serious and sober minded, that you may give yourselves to prayer. 6 For for this cause was the gospel preached also to them that are dead, that they might be judged according to men in the flesh, but live according to God in the spirit. 7 But the end of all things is at hand: be ye therefore sober, and watch unto prayer. 8 And above all things have fervent charity among yourselves: for charity shall cover the multitude of sins.